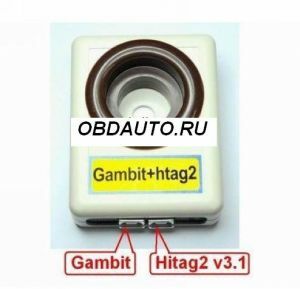 (Gambit programmer)is intended for RFID ( transponders ) programming.it is mainly produced for programming RFID transponders and generating RFID transponders from the immobilizer dump/eeprom of the car, in order to be able to start the vehicle. Gambit programmer works with PCF7935, PCF 7936 and T5 transponders which are not precoded and are completely blank. Note 1. Transponder is OTP (One Time Programable). Note 3. Transponder can be emulated on PCF7935. HiTag2 v3.1 programmer is universal keys programmer, with additional options of keys programming from dump and PIN extraction. Just insert blank key or appropriate transponder you need to program. Device detects transponder type and will do everything automatically! 1. Latest versions of HiTag2 transponders are fully supported! 2. Widest range of supported cars, using HiTag2 protocol!